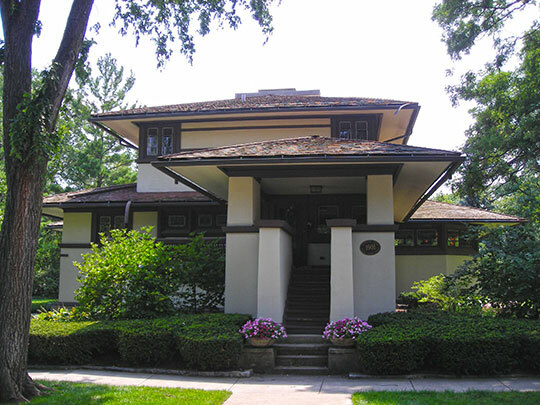 Photo: Frank B. Henderson House, ca. 1901, 301 South Kenilworth Avenue, Elmhurst, IL. Designed by Frank Lloyd Wright. Listed on the National Register of Historic Places in 2002. Photographed by User:G LeTourneau (own work), 2007, [cc-by-3.0 (creativecommons.org/licenses/by/3.0)], via Wikimedia Commons, accessed November, 2013. DuPage County Courthouse is located at 505 North County Farm Road, Wheaton IL 60187; phone: 630-682-7467. The first permanent settlement in DuPage county was made by Stephen J. Scott (of Maryland) about 1830. The county was formed February 9, 1839. The county is purported to have been named for the DuPage River, which, in turn, derived its name from an early French trapper and trader in the region.